GISCorps is a group of GIS professionals that volunteer their time and skills in order to create a better world. Started in 2003, GISCorps' goals revolve around helping to improve quality of life through supporting humanitarian relief, enhancing environmental analysis, encouraging and fostering economic development, supporting community planning and development, strengthening local capacity by adopting and using information technology, and supporting health and education related activities. Utilizing GIS for its mapping capabilities is a no-brainer. Answering questions like "what's the fastest route to work" or "where is that manhole located" are all great uses of GIS. But, using GIS for local insights can help individuals, businesses, communities, virtually anyone to make better, smarter choices. On this blog, we talk a lot about how GIS relates to everyday life. But, one of the best things about GIS is it enables us to explore hypothetical situations in very cool ways. A great example is a new map on Esri titled "(Is there) Life on Mars?" Yesterday, our Waukesha office held a seminar concerning Wisconsin DNR audits for MS4 permit holders. While a bunch of great information was discussed, our very own Bronson Jastrow, GIS whiz and famed #TipTuesday writer, presented on how GIS can help keep communities prepared- especially if they're facing a dreaded audit! One of the best ways GIS can help is by keeping communities organized. Our GIS capabilities allow you to link documents (such as design and compliance records) straight into a map, making them easy to access and all compiled in the same place. 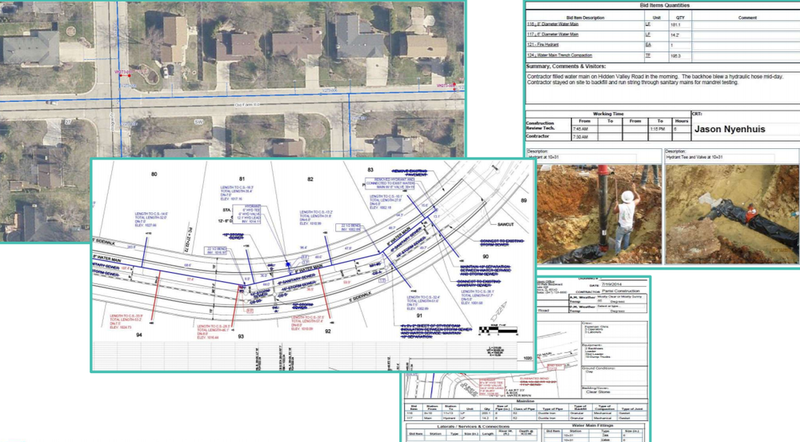 Beyond the simplicity of linking, viewing, and organizing documents, we have a suite of tools that can make preparing for a DNR audit a breeze, such as: Erosion Control & Inspection, Illicit Discharge, Pond Inspection, and Storm Structure Maintenance & Cleaning - keeping a history of compliance on each storm water asset. If you want more information on WDNR MS4 audits and how GIS can help, check in with your favorite GIS tech, or hop over to our website where we have the presentation slides uploaded! Los Angeles is getting street clean-up help for the entire city, street by street, with the use of GIS capabilities. LA's mayor, Eric Garcetti, has started a Clean Streets Initiative that entails driving every single street in LA and giving the block a "cleanliness score" from 1-3 (1=Clean, 2=Somewhat Clean, 3=Not Clean). This practice puts LA as a leader in the US, as it's the only large city conducting a regular cleanliness assessment of every city street. Once each street is assigned a number, the City is broken up into grids to help the Bureau of Sanitation strategically deploy resources to areas, such as a new dedicated Clean Streets clean-up crew. Clicking on any grid will tell you the area, and the average score of the streets within the grid. Using this information, the City can indicate areas of the most need, like making sure there are clean routes to school, preventing illegal dumping hotspots, and deploying trash bins in litter-heavy areas.